SANTA MONICA, Calif.–(BUSINESS WIRE)–The Recording Academy™'s GRAMMY Recordings® and Republic Records have revealed the track listing for the 2019 GRAMMY®Nominees album. Set for release on Jan. 25 in stores and via digital retailers, the latest installment of the best-selling series—now in its 25th year—features a collection of top-charting hits from many of this year's illustrious GRAMMY-nominated artists. A portion of album proceeds will benefit the year-round work of the GRAMMY Museum® and MusiCares®—two charitable organizations founded by the Recording Academy that focus on music education programs and critical assistance for music people in need. 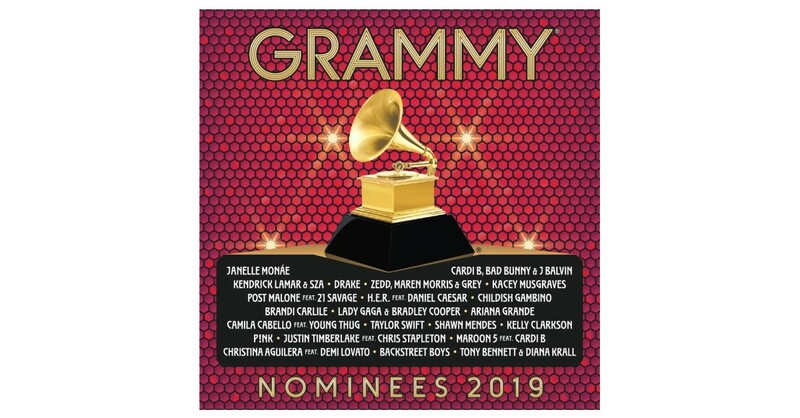 The 2019 GRAMMY Nominees album features 22 hits from the world's top recording artists and emerging talent, including Record Of The Year nominees Cardi B, Bad Bunny & J Balvin; Brandi Carlile; Childish Gambino; Drake; Lady Gaga & Bradley Cooper; Kendrick Lamar & SZA; Post Malone featuring 21 Savage; and Zedd, Maren Morris & Grey. Music fans can log on to 2019GRAMMY.com to pre-order the album and enter for a chance to win a trip for two to the 61st Annual GRAMMY Awards®on Sunday, Feb. 10, at STAPLES Center in Los Angeles. The 61st Annual GRAMMY Awards telecast will be broadcast live on the CBS Television Network at 8 p.m. ET/5 p.m. PT. *No purchase necessary to enter or win. Visit 2019GRAMMY.com for details and eligibility requirements. The Recording Academy represents the voices of performers, songwriters, producers, engineers, and all music professionals. Dedicated to ensuring the recording arts remain a thriving part of our shared cultural heritage, the Academy honors music's history while investing in its future through the GRAMMY Museum, advocates on behalf of music creators, supports music people in times of need through MusiCares, and celebrates artistic excellence through the GRAMMY Awards—music's only peer-recognized accolade and highest achievement. As the world's leading society of music professionals, we work year-round to foster a more inspiring world for creators. For more information about the Academy, please visit www.grammy.com. For breaking news and exclusive content, follow @RecordingAcad on Twitter, “like” Recording Academy on Facebook, and join the Recording Academy's social communities on Instagram, Tumblr, and YouTube. A division of Universal Music Group, the world's leading music company, Republic Records is home to an all-star roster of multi-platinum, award-winning legends and superstar artists such as Ariana Grande, Black Sabbath, Florence + the Machine, Hailee Steinfeld, James Blake, James Bay, John Mellencamp, Julia Michaels, Kid Cudi, Liam Payne, Of Monsters and Men, Post Malone, Seth MacFarlane, Stevie Wonder, Taylor Swift and more. Founded by brothers and chief executives Monte and Avery Lipman, it is also comprised of innovative business ventures, including American Recordings (The Avett Brothers), Boominati Worldwide (Metro Boomin), Brushfire (Jack Johnson), Casablanca Records (Tïesto), Cash Money (Drake, Jacquees, Nicki Minaj), Hollywood Records (Sofia Carson, Zendaya), Lava Records (Greta Van Fleet, Jessie J, Lorde), Monkeywrench (Pearl Jam), XO (The Weeknd, Belly, NAV), Young Money (Drake, Lil Wayne, Nicki Minaj), Roc Nation (Jaden Smith, Justine Skye, The Dream), among others. Republic also maintains a long-standing strategic alliance with country powerhouse Big Machine Records, and Universal Music Latin Entertainment. In addition, Republic has expanded to release high-profile soundtracks for Universal Pictures (Fifty Shades of Grey, SING), Fox TV (Lee Daniels' STAR, The Four), and NBC TV (The Voice), as well as other notable film and television franchises.